The personal care industry makes products such as deodorants, shampoos, toothpastes, body washes, detergents, and more. For their consumers, manufacturers in this industry have used quite aggressive chemicals and are constantly developing new formulas to produce better products with each attempt. Most of these products use chlorides (salt) as the major ingredient. These chemicals are good for the desired end results, but they can sometimes damage the material that is used for making these products. Type 316L stainless steel is often the material of choice for the construction of piping lines used in manufacturing personal care products. 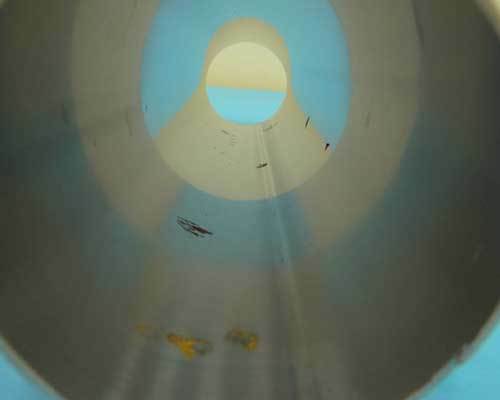 In November 2008, only six months after installation, a well-known deodorant manufacturer encountered leaks in the transfer piping lines. Poor quality material and poor fabrication practices were blamed, and all the pipe lines were replaced with new type 316L in March 2009. Unfortunately, the replacement was not the answer, and six months later pitting occurred in the transfer lines again. The second replacement was also not the answer, and in November 2009, there were leaks observed in the transfer lines again. A third replacement was installed in December 2009, with fabrication practices receiving the blame. It was decided to change the fabricators to discount that factor later on. This change didn't help much. There was still corrosion detected in February 2010. 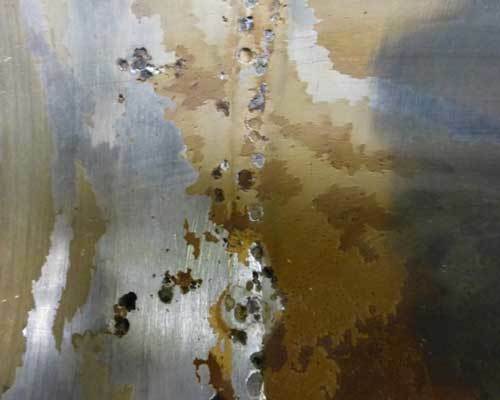 A corrosion investigation effort was initiated to determine a suitable replacement material. 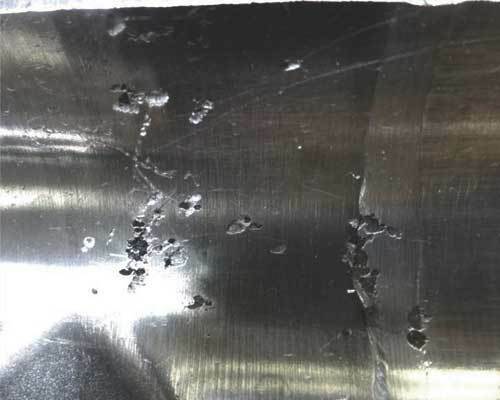 Cyclic polarization testing indicated that Type 316L had very low resistance to pitting corrosion in the product formulation compared to AL-6XN® Alloy. Many food, beverage, biotech, and personal care industries have approached CSI not only for the outstanding corrosion resistant AL-6XN material, but also for their excellent service and ready-to-ship stock availability. In the same conditions, AL-6XN has very high pitting resistance, higher than expected in product formulation manufacturing. An alternate piping material considered was CPVC (Chlorinated Polyvinyl Chloride), but was discarded due to interference in the appearance and odor in the finished product and for other hygienic and sanitary reasons. The replacement program was initiated in June 2010, and Central States Industrial (CSI) was able to give a fast service response providing many of the AL-6XN prefabricated piping sections. Many food, beverage, bio-tech and personal care industries have approached CSI not only for the outstanding corrosion resistant AL-6XN material but also for their excellent service and ready to ship stock availability. The user attests to CSI being recognized as a world-wide source for special alloys and fabricated components. The service experience to date at the location indicates AL-6XN was an excellent choice of replacement material and has not detected any problems so far. *The cost comparison shown above is an approximation and may vary greatly depending on the specific product and location. The customer came to us for a clean-in-place (CIP) system for their mascara line. The new system reduced water consumption and was a faster ROI. Which factors should affect alloy choice for process systems? Physical and chemical properties, corrosion resistance, welding, and availability.